Perhaps you have a favourite playlist for going to the gym or the park. 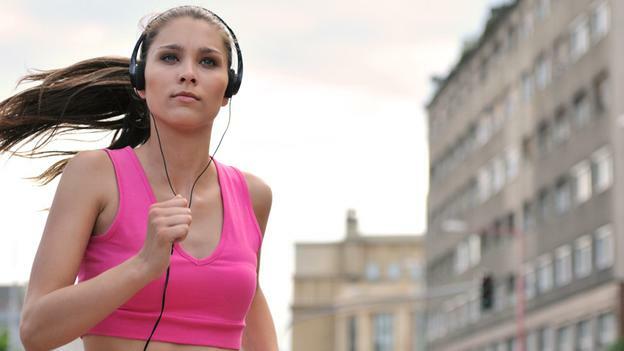 Even if you haven't, you're certain to have seen joggers running along with headphones in their ears. Lots of us love to exercise to music, feeling like it helps to reduce effort and increase endurance. As a psychologist, the interesting thing for me is not just whether music helps when exercising, but how it helps. One thing is certain, the answer lies within our brains, not the muscles we are exercising. A clue comes from an ingenious study, which managed to separate the benefits of practicing a movement from the benefits of training the muscle that does the movement. If you think that sounds peculiar, several studies have shown that the act of imagining making a movement produces significant strength gains. The benefit isn't a big as if you practiced making the movement for real, but still the benefit of thinking about the movement can account for over half of the benefit of practice. So asking people to carry out an imaginary practice task allows us to see the benefit of just thinking about a movement, and separates this from the benefit of making it. The signals to move the muscles start in an area of the brain called, unsurprisingly, the motor cortex. It's in the middle near the top. Part of this motor area is known as the supplementary motor cortex. Originally thought to be involved in more complex movements, this area has since been shown to be particularly active at the point we’re planning to make a movement, and especially crucial for the timing of these actions. So, this specific part of the brain does a very important job during exercise, it is responsible for deciding exactly when to act. Once you've realised that a vital part of most sporting performance is not just how fast or how strong you can move, but the effort of deciding when to move, then you can begin to appreciate why music might be so helpful. Of course there are lots of other reasons we might exercise to music. For example, a friend of mine who jogs told me: "I started running to music so I didn't have to listen to my own laboured breathing." He might well have started for that reason, but now I'll bet the rhythm of the music he listens to helps him keep pace through his run. As one song might have put it, music lets us get physical.